Swallows mate for life, which displayed ones love for their sweetheart when given as a gift. 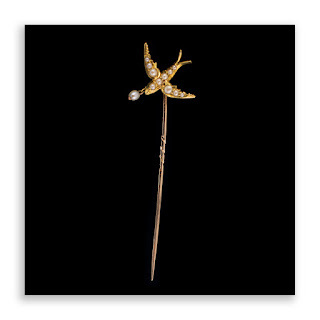 This superb antique swallow bird stick pin crafted in 18ct gold shows the bird in flight and set with graduating seed pearls and featuring a further pearl drop. The bird is nicely crafted in 18ct gold. The gold bird has been tested for 18ct gold quality but the pin I don't think is gold.